On Thursday night, Hillary Clinton and Bernie Sanders will face off in their first debate in over a month ahead of New York's critical primary on Tuesday. CNN and NY1 News will co-host the debate, which begins at 9 p.m. ET, from the Duggal Greenhouse in the Brooklyn Navy Yard. The outcome of New York's primary could be significant since it awards a whopping 247 delegates to the Democratic candidates, which are distributed proportionally. Clinton's campaign has expressed confidence that the former New York senator will win her home state. She and President Clinton have lived Chappaqua, a suburb of New York City, for nearly two decades. Sanders' campaign, on the other hand, has suggested the results will be tighter than expected. The debate comes after weeks of what has devolved into a bitter battle between the two candidates. First, there was an issue over whether there would even be a debate. Sanders' campaign insisted for more than a month that they do a Brooklyn-based debate, but then the campaigns entered a passive-aggressive week-long exchange in which they were negotiating their next debate through the press. Last week, Sanders then unleashed a harsh attack against Clinton, arguing that she is not qualified to be president. He later walked that statement back and then questioned her judgment on CBS's "Face the Nation" on Sunday. 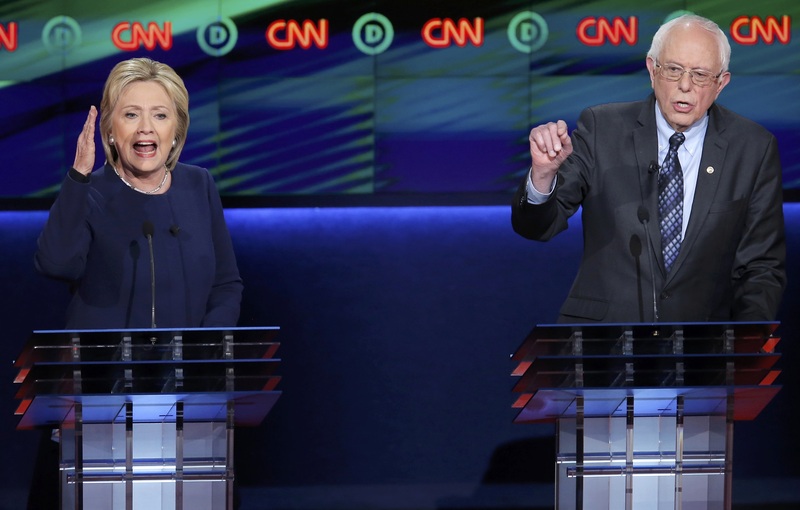 Sanders attacked Clinton this week on the issue of fracking, or hydraulic fracturing. It's a drilling technique that injects fluid at high pressure into shale to fracture it and access natural gas. Ahead of New York's primary, the New York transit union endorsed Sanders for president while the New York State Immigration Action Fund endorsed Clinton. The New York Daily News also endorsed Clinton in an editorial. Recent polls show that Clinton is leading in the Empire State. A Quinnipiac University poll released Tuesday found 53 percent of likely Democratic voters back her while 40 percent said they are for Sanders. According to CBS News' latest count, Clinton has 1,755 delegates while Sanders has picked up 1,059. CNN's Wolf Blitzer will be the main debate moderator and CNN's Dana Bash and NY1 host Errol Louis will also ask questions.